What the Heck is an RSS Feed? We’ve all seen them . . . those little RSS icons (sometimes with text prompting you to subscribe). You may already have an RSS feed set up. You probably have subscribers and routinely submit your feed to directories. Using RSS feeds may already play be part of your link building efforts or (if you’re relatively new to blogging), you may be a little perplexed by the whole thing. Subscribing to an RSS feed can be pretty intimidating. So what the heck is this RSS stuff all about anyways? RSS stands for Really Simple Syndication. To me, an RSS feed is like a “TV Guide” for websites where you’ve filtered the content to focus on only those channels/websites that you’re interested in. One way to access RSS feeds is using an RSS reader such as Google Reader, NewsGator or BlogLines to view the feeds that you’ve subscribed to. (Feel free to click on the “Subscribe to this RSS Feed” link at the top of this page to get blog updates from me.) Your RSS reader will check your subscriptions for website feeds that have been updated and then deliver them to you in a format that you can easily monitor and read. When I first wrote this article (back in 2010), I was still relatively new to blogging and I used Google Reader. Times have changed and I no longer routinely read RSS feeds. Back then, I was still seeking good content curators. I now am subscribed to a handful of RSS feeds that I have delivered right to my email but I also find myself reading online magazines created with Scoop.it and Summify. 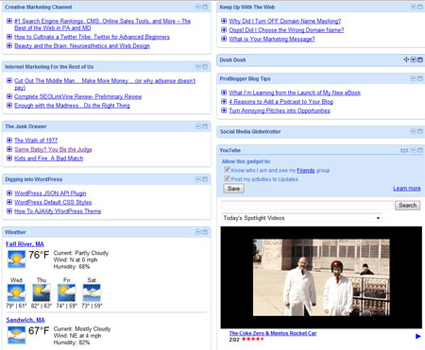 When I did use Google Reader, I had my Internet browser open to it when I launched it. That way, I could quickly check for updates throughout the day. Below is a partial screenshot of what my Google reader page looks like. Each light blue bar represents one of the RSS feeds that I’m subscribed to. Underneath most of them are 3 links and 3 plus-signs. The links are taken from the titles of the posts. I can preview the post by clicking on the plus-sign. When you only see a blue bar with no links below it, it’s because I’ve chosen to minimize that particular feed. By clicking on the drop-down icon (on the right of the bar), I can select expand this gadget and see the 3 latest updates. You’ll also notice in the screenshot that I like having the weather display (living in New England – that can be exciting) and the spotlight video from YouTube. It’s so easy to rearrange these feeds too. By moving your cursor to the upper left of any of these “gadgets”, you’ll see the move icon (4 intersecting arrows). Just left-click and drag to customize your page. If you’ve changed your mind and want to delete the feed completely, click on the drop-down icon and select delete this gadget. Having an RSS feed gives you one more opportunity to connect with your readers by making it easy for them to get updates. Of course, one size never really does seem to fit all. So, be sure to offer people other ways to connect with you including social networking sites like Twitter and let’s not forget email. That’s still the communication method of choice for lots of people. CAUTION: Feedburner is great and I recommend using it. However, bloggers need to tweak the settings. The default settings redirect backlinks to Google and away from your site. Here’s an excellent article on what to do to prevent this: Feedburner Is Stealing Your CommentLuv Backlinks! Thanks for explaining this technology so clearly. I am using feeds on several of my blogs. I was wondering if you know where I can find interesting and engaging feeds about local areas? Local news feeds? Local review feeds? Sean, I would start by searching on local news and then see where it takes you. If you find a news site or blog that you find interesting, you could follow their RSS feed. Sorry I can’t be of more help. Maybe another reader here will have a better suggestion. That’s a great place to start. You’ve been very helpful. Dia, Thanks for letting me know that you picked up a few tips from my article about RSS feeds. Hi, thanks for the article, I am new to this and am very interested in learning about it. This has provided great information that I did not know before and I know will be helping me in the future. But I was wondering, is there a particular place on the web page you should place the RSS feed? I added the RSS button along with the rest of my social media follow buttons on the top of my sidebar. This was the simplest way for me. I just added the HTML code into a text widget. Some people incorporate these buttons into their header graphic. This is a little more complicated to accomplish. Either way, I believe people look for them in the upper right of their screen. Definitely, put them “above the fold”, so that no one has to scroll to see them. Thanks for letting me know that you liked my post Chris. I subscribe to RSS feeds of a few bloggers who write about content that I find valuable. It helps me learn about topics that I’m less familiar with. In turn, I can share their valuable content which adds valuable to my tweets and likes. It can be a win-win situation. The thing is to not get carried away with following too many feeds because it can take a lot of your time. The concept of an RSS feed has always been confusing to me. Especially how to implement it on my blog. Your post has been very helpful in clearing things up for me. Well, at least now I can understand some portion of what the heck RSS means…been looking at that thing for years now, and ofc due to other factors I never rally got a chance to read about it. Thank you. I know Anna, for something that’s supposed to be “simple”, it can be pretty intimidating. You’re welcome. I remember being confused by them when I started blogging. They certainly come in handy now. There are directories that you can submit your RSS feed to too. I think there is a lot more to be done with RSS that a lot of webmasters neglect, often myself included. I personally rarely bother with it, but that’s not to say nobody else does. Recently wrote my own PHP generated XML feed as my site is not based on any existing platform – that was a challenge but ultimately, it now allows me to feed posts and products to Webmaster Tools and users more easily. One of the advantages of having an RSS feed is that you can easily submit it to directory websites. Sherryl Perry recently posted..Are You Struggling With Writing Your Next Blog Post? Sherryl, Thank you so much for the info on RSS feeds. I was thoroughly confused about them when I first started blogging and just used them because I felt it was necessary. I find that confusion amusing now that I know what RSS stands for! Thanks for the link to the article about the feedburner links — I think I’ll need to tweak my settings. Thanks again, Sherryl! You’re welcome Trish. I felt RSS feeds were overly complicated in the beginning too. Good luck with your Feedburner configuration. It’s a simple but necessary fix. Thanks sherryl for this informative post and really impressive things learn from your blog about RSS which i have never know before. Sherryl Perry recently posted..Can Someone Tell What Your Website/Blog Is About In 3 Seconds? That’s interesting Mark. I’ve never used tweetdeck but I hadn’t heard that it’s another way to get junk. I am dealing with a horrendous amount of email to my main email address for this blog and the thought of any more junk sends shivers down my spine. I’ve been using RSS to just keep up on things but I find having tweetdeck running in the office helps keep up to date on new developments just as well. The downside is you have to filter out a lot more junk but you do get to interact with some of the smartest people in your fields. For a long time i had no idea what RSS is, i just noticed everyone has it and i figured i’d ignore it because it’s can’t be that important. Till one day i got to reading a few articles about it and that was the day RSS became indispensable in my life. It’s like something you never knew you wanted, but now can’t see yourself without. Stan, RSS feeds are a good way to keep up with the posts from your favorite bloggers. Although I didn’t address it in this article, it’s also a good idea to subscribe your own RSS feed to directories to help drive more traffic to your blog. Sometimes I think about writing a post about RSS feeds – because I find people don’t really get how easy it is to keep up with multiple blogs if you use an RSS feeder. This is a great introduction. Thanks Leora. Sometimes, I hesitate writing a post about something that may seem basic to experienced bloggers but it’s surprising sometimes to learn what it is we don’t know. Thanks for making it so simple! Very helpful! I’d always thought RSS feed is such a complicated thing to learn but I guess I just did not found the right tutorial yet. Thanks for sharing this information. It’s funny that some people are still confused by the RRS feed, that’s why this post is so perfect. I’ll have to look into scoop.it. Thanks! You’re welcome Dennis. I remember when I was knew to blogging that I didn’t have a clue what an RSS feed was or how to go about either reading someone else’s or implementing my own. Good luck with Scoop.it. Nice post. This reminds us of the importance of RSS Feeds. With so many things going on RSS Feed helps me see updates that I prioritize. Did you see Jym Tarrant’s link above to his list of directories that we can submit our RSS feeds to? That is one of the easiest things we can do to help drive traffic to our website. Sherryl Perry recently posted..What’s Your Best Customer Service Story? Nice overview of RSS Sherryl. I’ve meant to do something like this for a while – it took me ages to work out what RSS was and how to get mine set up to make proper use of it. One of the other great ways to benefit from having one is by submitting it to Feed Directories so that as you publish posts, they get indexed and linked across the web. I’ve linked to a list of such directories in the CommentLuv link below. Love the way you describe RSS readers as a ‘TV Guide’ – that’s exactly what they are. I have the same problem as with TV though – there’s too many programs I want to check out! You must be a mind reader! I recently read your article and intended to submit my feed to the directories that you listed. I was just in the process of looking for this when I got distracted by another post talking about Christian Hollingsworth’s new directory YouDoFollow.com for do-follow blogs. I just completed submitting my site and a couple of articles to that and I was going to search for your article again. So, your timing is perfect! Thanks so much for sharing this with us. That’s a happy coincidence Sherryl! RSS is such an important part of your blog, although it does go largely un-noticed. It’s a fantastic and hugely popular way for readers to view your content and stay in touch with what you are talking about without visiting your blog. This article is a nice reminder for me that maybe i should assume that my clients might not know the power of some hiddens internet gems. It can be challenging to write about topics when our readers range from beginners to “gurus”. The way I look at it is that sharing our experiences can help someone make the decision whether or not a particular tool or idea may be a good fit for them. I do remember when I first started blogging and trying to figure out RSS feeds. It can be a little bit overwhelming. You’re right about “hidden internet gems”. It’s amazing how many of them are out there. Thanks for taking the time to join our conversation! Your Welcome! I’ll be back, i’m sure! I’m still using Google Reader, but the truth is i’m not that big of a RSS fan, so my needs are rudimentary. Heard great things about Feedburner though, even if i know it’s a bit more complicated. The thing about Feedburner is that once you set it up, you don’t (usually) have to think about it again. It is worth checking your feed every once in a while to make sure it’s running properly. If someone does discover a quirk (or something that many of us may not know), someone will blog about it. For example, I updated this article with a “caution” about Feedburner directing your backlinks to Google rather than your site. We need the traffic more than Google does. It’s a very easy fix, you just need to know that it needs to be done and how to do it. Informative post, we should stick together us bloggers and you show the spirit of this wholeheartedly! Great to see you over on my blog too – I’m sure we have a few goodies to share and to learn from each other, thanks for sharing, keep up the good work. Good article. Also use Google Reader and get all kinds of information updated daily. And feedburner is great for subscriptions. Catarina, I stopped using Google Reader for a while but I did really like it when I used. Since you, Susan, Ray and Catherine all are using it (and others), I think I should go back to having my browser open to it. I’m sure I’ll need to update it but that may be one habit I fell out of that I should go back to using. That is interesting that one of your connections sent you an explanation of RSS. Sherryl Perry recently posted..Are Business Women More Receptive to Helping Each Other Online? Always of value, thanks Sherryl! Thanks Judy. Another blogger shared this article on Facebook and someone commented that RSS feeds are “a bit old school”. They may be but they are still a great way to share our blog posts. Hi Sherryl ~ I knew what RSS was but I never knew about readers. After reading your blog and all the comments I think I’ll go check out Google Reader. I certainly learned a lot this morning! Super! Thanks for letting me know June. I always enjoy learning something new. After reading the whole content I now understand what really is an RSS. I’ve been confused about it and asked many people about it but never got a satisfactory answer. Thanks for the great post I’ve really learn’t a lot from this. Thanks for letting me know that you found this helpful James. wow, thanks for this info. I was always wondering what RSS stands for, but never been too motivated to look around, until now. Thanks for helping me to understand better what “Really Simple Syndication” means. Eleanora, You’re very welcome. I just updated this post with a link to an article that shows you how to change the default settings for Feedburner. I also included the link in the comment above yours. If you’re new to Feedburner, you’ll want to follow the instructions to edit the settings. There are multiple benefits of using Google Feedburner instead of the default feed provided by the blog. One is that you can monitor the traffic generated by your feed and who your subscribers are. Additionally, you can monetize your feed by integrating your adsense account with the feed so that it will show advertisements along with your feed. You just reminded me about a setting in Feedburner that directs your backlinks to their site. You have to go in and change it. Here’s an article that explains how: http://www.wpkube.com/feedburner-stealing-commentluv-backlinks/ (I’m going to update this post to let people know.) I’m glad you mentioned the word “default”. Thanks for the tip. The post you mentioned shows how easy it to resolve the issue with backlinks. Catherine, Thanks for reminding us that search engines love RSS feeds. (I should have mentioned that!) It’s good to hear that so many other bloggers here find RSS feeds valuable. Buffer is a great app too. It’s definitely worth looking into. I like Google Reader. I kind of skim over things in it and if something attracts my attention I go directly to the post to read it. I know some people do all or most of their reading in a reader and only go to the site or post if they want to comment. Either way readers are convenient. There are a lot of people that have no idea what an rss is or reader. So even when you put the rss icon or link on a site chances are some people do not know what that means. All you can do is point it out and educate visitors how helpful they can be not to mention they can save a lot of time too. Between you and Susan, I’m thinking I should go back to using Google Reader. I’ll at least try it again. I’m getting to the point that I don’t even want to open my email inbox any more. I certainly agree with you that a lot of people don’t understand RSS feeds. Maybe it was time to bring this up again. It’s good to see how many people do still use them. To me, an RSS Feed is just like a daily supply of newspaper thrown into your backyard by the newsman on bike. I actually use my reader and find it better than subscribing by email as I tend to look at it in the morning. What I don’t like is when you are not given an option to subscribe via RSS. One thing I haven’t done and it has been on the to do list for about 2 years is provide a page that explains the RSS feed to make it easier for subscribers. That’s the habit that I used to be in Susan. It does work well and since I’m having a major issue with spam, I might go back to doing that. The thing that irks me when I’m subscribing to an RSS feed is to not have the option to receive it via email. Sherryl — I have an RSS feed in Google Reader, but I have to admit I seldom check it. If I want to subscribe to a blog I do it by email. So I’m selective about the content I subscribe to because my email inbox is overflowing as it is. I’ve made a determined effort to unsubscribe from the posts I hardly read. But I’ve also noticed that I’m receiving unsolicited subscriptions from people/companies I don’t know. You are supposed to opt-in to receive these so I don’t know how they they’ve found me to target. Possibly I attended an online seminar and they are using those lists. I didn’t know about Scoop.it and Summify and just went to look. I’ve resisted the temptation to subscribe! Jeannette, Your email situation sounds like mine. I disabled G.A.S.P. briefly when I was dealing with the problem between the W3TC plugin and my Thesis theme. Now, my main email address is being spammed. Rather than using email to follow a lot of blogs, I find it easier just to follow links in tweets. So many of us are connected that even if I miss a tweet about apost, someone else in the group will RT it and I’ll follow it there. Thank you for this. I had followed several blogs but did not know where to see them at. Now I will have to re-follow I guess. That depends if you followed them or subscribed to their RSS feeds. If you set up Google Reader, you’ll see any feeds that you’ve already subscribed to. I have now read this 3 times – so much to digest and get my head around. RSS has been a long term pain but I think you just gave me the aspirin. For something that’s supposed to be simple, it can be a bit of a nuisance. Once you get it set up, you don’t have to think about it much. Thanks for letting me know that you found my article interesting. Sometimes, I write about the more mundane “stuff” because it may be boring but it can still be important. Hi Sherryl. Firstly thank’s to Joseph (above). I too will be off to check out amplify in a moment. Second. What a twit. It just occured to me while reading your post, I knew what an RSS feed was but didn’t know what RSS stood for. Never really thought about it before. I’ll be sharing this with a few clients that are still learning. You’d be surprised how many people are still learning about RSS feeds. Thanks for the resource, Sherryl. Thanks for sharing this Dennis. I’m not surprised that people are still learning about RSS. For some reason, I was a little bit confused by the concept when I first started. It’s one of those things that’s easy to ignore at first and then after you start using it, you wonder why it took so long to learn it. Sherryl, I’ve just “Amplified” your RSS post. Heard about Amplify? First time for me to use it – it provides what appears to be a Goog PR6 straight-off-the-bat link, which is a DO-FOLLOW. Whether the PR6 sticks for long, I’m not sure, but let’s hope Amplify continue to go with do-follow, unlike so many SM and SB sites who now seem to be no-do-follows (thanks spammers). Thanks for the heads-up on Amplify and for for “amplifying” me! 🙂 I’ll definitely check this out. As for sharing “goodies”… count me in! Have a good weekend. Haven’t checked out amplify too. Do they really give away good kind of service? Glen, I wouldn’t call Amplify a service as much as I think of it as another social networking site where I connect with other bloggers. It creates an “amplog” which is fed from all the posts that you amplify. (Mine is keepupweb.amplify.com.) That log has driven zero traffic. Having said that, I continue to amplify my weekly posts. New people follow me on Amplify and they are usually bloggers who could be potential clients. Whether or not it would be a good fit for you depends on your niche. Maybe someone else reading this has an experience with Amplify that they could share. That is very kind of you Sherryl! We should stick together us bloggers and you show the spirit of this wholeheartedly! Great to see you over on my blog too – I’m sure we have a few goodies to share and to learn from each other! Hi Sherryl, I just came over from Tia’s blog. RSS – one of the things that’s “scared” me – literally for years, even though the RSS stands for really SIMPLE syndication! I wish I could have read your post when I first started out online and with my own blogging – would have enhanced my understanding of RSS so, so much! Great post! I retweeted it as a way of saying “thanks!”. I just checked out your blog and I loved your post on “Social Media is Driving me Insane!” so much that I Dugg it, commented and tweeted it too. I’m grateful to Tia that you found my blog and now I’ve found yours too!